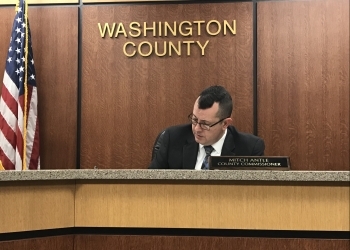 Aside from touring the Washington County Correctional Facility, the Washington County Commissioners held a regularly scheduled meeting Monday morning. The chairman and vice-chairman for the board were elected to start the meeting. District 1 Commissioner Mitch Antle was selected as the chairman for the Board of County Commissioners while Mike Dunlap was named the vice-chair. As the newly elected chairman for the Board of County Commissioners, Commissioner Antle will serve as the chairman for several other boards. Those boards include: the Budget Board, the Tax Roll Correction Board, the Washington County Building Commission, the Washington County Correctional Facilities Authority and the Board of Health. As for other appoinments to boards, District 3 Commissioner Mike Dunlap will serve as a board member for the Washington-Nowata County Community Action Foundation. Dunlap has 12 years of experience on the board and thought it would be wise to keep serving on that board. He will also serve on the SIG/SIF Board and serve as an alternate with District 2 Commissioner Mike Bouvier on the Grand Gateway E.D.A. Board of Directors, Trust Authority and Home Finance Board. Commissioner Bouvier will also serve alternatively with Dunlap as a representative on the Grand Gateway Board of Directors. Bouvier will serve on the Washington-Nowata County Community Sentencing Council and on the Oklahoma Public Employees Health and Welfare Plan Board. Lastly, the Washington County Commissioner approved their meeting for 2019. They also approved the disposal of a Crafco Hot Patcher and a Duro-Patcher in District 2.